The Zohar teaches that Moses, our Teacher, "appears" in each and every generation. In each generation there is one unique individual who is the embodiment of Moses, our Teacher, in that generation. The spirit of Moses emanates to all the wise men of the generation, and subsequently from them to all those living at the time, illuminating Jewish souls with the light of the inner, hidden parts of the Torah ("the 'soul' of the Torah"), bestowing upon them the power of the Supernal Knowledge, the power that enables one to know and cling to the "Giver of the Torah," G-d, Blessed be He. After the giving of the Torah (at the beginning of the month of Sivan), Moses ascended Mt. Sinai, where he stayed "forty days and forty nights" until the seventeenth (tov--"good" = 17) of Tamuz ("there is no 'good' other than Torah"--Ethics of the Fathers 6:3). Were it not for the sin of the golden calf--which came about as a result of the imaginative faculty's deception that Moses had died (Talmud Bavli, Shabbat 89a)?we would have merited the ability to see concretely G-d's "goodness" each day (as it is known that "G-d is the essence of 'good'," "and by nature, one who is good always desires to do good"). That very day witnessed the completion of the giving of the true "good" to the "good" people, or as the Sages state: "Let the "good" one (Moses) come and receive the "good" (Torah) from the "Good One" (G-d) for the "good" people (Israel; Talmud Bavli, Menachot 53b). Those 40 days that Moses stayed on the mountain (in a state transcending time as it is known on this worldly plane... "He ate no bread nor did he drink water"--Exodus 34:28 ) parallel the 40 generations in the transmission of the Torah from Moses, our Teacher, (who received the Written Torah [in its completion, but also the initial revelation of the Oral Torah]) until Rav Ashi (in whose generation, through him, the Oral Torah was sealed) as elucidated by Maimonides in the Introduction to his great legal work, Mishneh Torah. Moses, our Teacher, lived in the 26th generation after creation. 26 is also the numerical equivalent of G-d's Name Havayah associated with the Written Torah (in the secret of the sefirah of tiferet--"beauty" as discussed in the Kabbalah). Rav Ashi is the 65th generation (26 up to and including Moses and an additional 39 generations until Rav Ashi)--65 is the numerical equivalent of another central Name of G-d, Adnut, the name associated with the Oral Torah (the secret of the sefirah of malchut--"kingdom"--"malchut is the mouth, it is also called the Oral Torah" [Patach Eliyahu]). Concerning the essential unity of these two Names it was stated to Moses when G-d revealed Himself in the burning bush: "This is My Name (Havayah), as it is written?paralleling the Written Torah) forever, and this is My remembrance (Adnut--as it is pronounced--paralleling the Oral Torah) from generation to generation" (Exodus 3:15). It is taught in the Kabbalah: "The end is enwedged in the beginning" (Sefer Yetzirah 1:6). Indeed Rav Ashi is hinted at the outset of the Written Torah, the Torah of Moses: the first five letters of the Torah (of the word Breishit) are a permutation of the name of Rav Ashi! The generational chain in the transmission of the Torah is not to be viewed as occurring only at the level of "development" and "evolution" (descriptions used in understanding the "unfolding of worlds" during the process of creation). In any process of development and evolution the "end" of the "upper level" is enwedged in the "head" or "beginning" of the "lower level" (as in the form of a ring chain). The "end" of the influencing one (the teacher) can reveal (oral) teachings to the receiver. This instruction enters and is grasped by the "head" of the receiver. However, the generational transmission of the Torah is much more than simply a process of development and evolution. More accurately it is seen as the "enclothment" of the teacher within the student-receiver, similar to the understanding that the soul is "enclothed" within the body in order to bring it to life and give it continued existence. Not only does the revealed knowledge of the teacher pass over to the student in an evolutionary manner, but also the soul of the teacher is "impregnated" within the student, causing the awakening of the student's intellective power, which then flows as an "inexhaustible fountain." Moreover, and indeed more essential: from a deeper perspective the Rebbe (the Moses of the generation) and the disciple are truly "all one," completely unified. This level of revelation is the secret of the Divine "indwelling" in the acceptance of the Torah in each succeeding generation. The Hebrew name Moses is an acronym for "what was, is what will be" (Ecclesiastes 1:9). "Moses is Truth and his Torah is Truth" (Midrash Tanchuma, Korach 11), and as is known Truth is an eternal, unbroken quality. When G-d calls: "Moses Moses" (Exodus 3:4), we note that there is no cantillation note indicating a break, a pause, between the two "Moses." Both Moses and the Torah partake of the eternal, of the unbroken, because both reflect Truth. During the 40 days from the giving of the Torah until the seventeenth (tov) of Tamuz, Moses (and through him all Jewish souls) received illumination from the Divine Indwelling. This Divine inspiration was bestowed at the giving of the Torah to Moses for that, and each succeeding generation until the coming of the Mashiach--"Moses is the first redeemer and he is the final redeemer." The sin of the golden calf resulted from a lack of consciousness of this secret. Moses' advanced level of awareness on the mountain (ba'har is similar to the word be'hirut denoting crystal clear understanding) did not bring the Jewish people to a similar level of Divine consciousness. Therefore, after the sin, Moses is told: "Go down (from the mountain)" in order to lead the Jewish people to a conscious awareness of the Divine Indwelling. For one who attains this Divine awareness (and thereby rectifies the sin of the golden calf, the false illusion that "Moses died" as above), Moses lives eternally--a soul within a body--"For the earth (the body) will be filled with the knowledge of G-d (the soul of Moses) as water ("I drew him from the water"--Exodus 2:10) covering the sea-bed" (Isaiah 11:9). Has no one any comment to make on this? Admin wrote: Has no one any comment to make on this? Hey there Bob,, Me again. Don`t get me wrong Brother I do see that there has been many workers of God through history, some more some less ,some inbetween and subject to the Mixture, on a continuous basis always. before Jesus Christ came to teach His disciples, and spread the Kingdom , anyone taking the Christ in them was impossable, under the logos it was not that time yet. well anyway with Jesus Christ included I do believe that there was many , even now as we carry the light torch for God. The one of the points I like here at this site is that we all pretty much agreed that all the earthly traditional religions are false and in error, some more than others. Were there are realy only Two; The lamb of the Elohem (Christ of the Father) and the whorship of Satan. Everything else is of satan. This is were I was abit puzzled in reading your post. The context does say all that is claimed it does. But the whole context is of traditional Jewish belief, being the torah, Kabahla amd Old testiment etc; Bob doesn`t this contradict what we have been telling others here that all Religions are flawed and should come out of them? I`m just asking, but I know I still sound like the advocat. Honestly I am only striving to speek in one voice with others, by Gods graces. May the Love of God be we us all.. Yes indeed, it is not only the religions and their traditions that are flawed, but ALSO their "sacred" scriptures! Do you realise that we have NO Aramaic textual transmission coming directly from Yehoshua (i.e. not one word of his reported in His own language!) - so we are entirely reliant on some unknown Greek translator(s) - if indeed the words are direct translations, and not just hearsay stories passed from person to person (Luke's Gospel definitely was such as this! - see his introduction). But it is not the religions or their texts that I refer to, it is the MASTERS which stand hidden behind the religions - religions which all follow with a false understanding what the Master really revealed (through INITIATION) = GNOSIS. That is why it is necessary to seek a true living Master - not rely on teachings from corrupted texts and traditions of historic worldly religion. All we can clearly see from these various scriptures is that there is always a Divine Teacher behind the revelations. This is a universal fact which cannot be denied. The Pistis Sophia, I believe, is one of your favourite texts, Thomas - do you believe that it presents perfect, uncorrupted, and complete Truth? I know that I could never be content with any book. blessings to you Brother Bob, I do agree whole heartedly that any of the texts where not written by there Authors ascribed to them, where many might have been copied almost one for one, and others might have been changed 180% out to prove that which isn`t, or send the sheepel astray. This would be congruent in the Mixture of mortal realm for mankind to decipher. Together with having the Father in us ,Christ as His word and Holy Spirit for direction We now have the ability to Find the truth that has been and what is of this Mortal plain by us , tri beings living here. as promted by my son to tell him why I believe in these thiings or texts I was quoting, I had to say I donot know but will fiind out. This is were I Started back from God,Christ and Holy Spirit as difinitive entities in my life that was truth, and is where I will begine my slate, rathure Clean, BUt pure. I then knew I was going to have to research step by step everything that had importance, and even some that crossed in there that seemed even it didn`t . This was easier cause I was looking now with almost an unbias point of view and strived for openness of heart. Now came the hardest part to start, How did you tell with two diferant stories which one is truer or both none at all. The answer which was very intricated was cross refferancing similar text, people, agendas, life styles, places etc. My first find was the Paul/Saul thing, being not an Aposle but so much creedance being given to him, it was kinda off beat having 15 epistles in the NT ya know. Even luke was not and got in. It felt like an agenda being set in place for a diversion, how ever slight with some things but still. continuing I know found Gnostics which were truly blessedness to me, because it answered how I lived from Christ comeing too me 30 years ago. A feeling from dark to a light with no limit. I realized the vastness of Gnostic scriptures and realized Paul even had a Gnostic scripture which puzzled me now from my previous findings of lies He perpetrated in a heavy degree of selfrighteousness. As I researched Gnostics, I read that for the highest degree of study for the gnostics should start with Apyc of John, Thomas, and Pistis Sophia which is the top one that learned many Top seekers of Gnostics in the past since its finding held it supreme. I for one I do not read introductions to a gosple or text, and never followed the croud for my own believe as Christ has taught me in my life. But read it out right, limit the Human error in its interpetation, due to that realy, is what we have been doing all our lives with things, not just in This area either. For there is nothing that we lack. My brother Pete , after showing Him the things of Paul, we also have found asked me " Why have men and great Religious theologians a nd reseachers for 1800 years not found what you have." I told Him a few have also that questioned Him and saw flaws, but the biggest reason, " I asked ". And yes you are right I do hold Pistis sophia`s information high in my sights, why ? because it is the only nearly complete teaching in the the higher mysteries of the Father for one. The one spooken of in mathue and luke. It was found in the direction of Daniels scripture by the man clothed in white as like the son of man. There are numerous accounts spooken of exact wordings in the NT, and constantine wanted these text and follows killed at all cost. There are many more proofs that cross referanve their vilidity Higher then Others I have done these checks into. But the BIggest one and most difinative one is " The mysteries are and do what they claim they can do when performed which is one in the Fathers" they are the power of powers. No other texts have transcended such power and beauty and direction of the completeness in the father Bob. One can only know them by believing and being in them, not just reading them. They are the large fish He says to keep while letting go all others. Now do I think this book is pure and uncorrupted? will to put a stamp on this Book like that would be dicrediting the Value of which it is about actually , what I can say is all the Glorious Gnosis with the father I recieved from reading its value therein, was complimented by the Father for attaining that which I grasped at this stag that I am in, with it. He helps keep me attune to errors reading all texts. Bob, You did Mention also about the Masters that stay Hidden behind the scenes. M't:5:15: Neither do men light a candle, and put it under a bushel, but on a candlestick; and it giveth light unto all that are in the house. For the Truth is shown to all with no fear. All I can say in reply to you is that our experiences are quite different. I am of the opinion that scriptures of any kind are not in the least necessary for obtaining Truth - in fact the Spiritual Gnosis which I speak of is not possible to put into words of any human language. This Truth is, however, totally accessible, even to a child, and also to those who are totally uneducated and illiterate, or cannot afford to buy books. All that IS necessary is that one is alive, and has a sincere thirst/hunger to seek for Truth. It is soooooooo simple - much tooooooo simple for our complicated intellect / ego to comprehend - THAT IS THE BIG PROBLEM. Just remember and consider carefully exactly what kind of people rejected Yehoshua while he lived on Earth, and also consider why they were too blind to recognise Him then. These are extremely important things to consider if we do not want history to repeat itself over and over again and again. Too shay Bob ... I do agree whole heartedly Brother, where seeking the child within unto the father will truly set one free. I have always told people and my sons that each moment that is wasted in deep controversy or anger or hatred or war even, is a moment that could not be Loving God or others in a positive way to help grow the Journey in truth to live by, and prosper. But maybe there has been a positive thing here we can see also, of ourselves . Prism1111 wrote: Don't get me wrong Brother, I do see that there has been many workers of God through history, some more some less ,some in-between and subject to the Mixture, on a continuous basis always. Before Jesus Christ came to teach His disciples, and spread the Kingdom , anyone taking the Christ in them was impossible, under the logos it was not that time yet. From this, I assume that you mean that no one before the first century of our common era (i.e. Yehoshua's incarnation) could have experienced the 'Christ Spirit'/'Logos'/'Divine Light'/'Shekhinah' within. In other words you hold that Yehoshua/Jesus (i.e. that one incarnation - that one bodily being - NOT the 'Spirit of Christ') was/is ALL important to the transmission of Divine Gnosis/Truth/Spirit. 'I tell you the truth,' Jesus answered, 'before Abraham was born, I am!'" My simple understanding of this is that "the Lord" (Heb. = YHWH or Yahweh = the incarnation of the 'ChristSpirit') is always incarnate on Earth and always ready to initiate all who seek the Truth. The Lord does not equate only with Yehoshua/Jesus of the first century AD - BUT MANY MANY OTHERS who incarnated to all parts of the world and at all times! This would also include the genuine Avatars of India (e.g. Krishna, Buddha, Nanak, etc. ), Persia (Zoroaster, etc. ), Egypt, Greece, etc. etc. etc. (perhaps many of the legendary characters of ancient mythology now lost in the mists of time - Thoth, Isis, etc.). Unfortunately, many are indoctrinated into believing that only their particular religion's historic "lord" is the ONLY one worth following. For Jews it is Moses, for Christians it is Jesus, for Muslims it is Mohammed. When will we see people receive the genuine "re-birth"/"cleansing" into NEW and REAL SPIRIT LIFE? The rebirth which eliminates all false beliefs of religion, removes the tags of identity (e.g. Christian, Jew, Muslim - what I call the religious mentality, e.g. the 'Jesus' mentality), and gives us ALL ONE TRUE UNDERSTANDING OF BROTHERHOOD AND LOVE? Peace and unity will not be possible on this Earth while people hang onto these false concepts about Jesus and Moses and Mohammed. We need to forget history, and advance to the PRESENT DAY. I hope everyone can comprehend the great evil being done in the world right now by these false beliefs. Bob, with Much prayer and oneness, your question has stirred much in me ,the Spirit which help me put my words in an identifiable way for you to consider. I like to say Jesus Christ in me cause I know that it is true, by way that after we come out of the Body here as Jesus had done and leaving it without spirit or soul for its Creator Satan (lord of this word) His Heavenly body and spirit were raised unto the inheritance. That would be our soul , as the soul of Jesus also. So it is He that enlightens me here now, of coarse with the fathers ok. 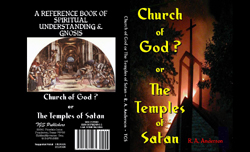 IT has been said that for many years the Gnostics and the understanding of them was gathered out of Opponents of the Gnostics, mainly as in Ireanesus and his book of heresies’, and many others. He had me post a few days back now , as I recall the importance in watching the advisary, wow I know why. If all those of the dark are undisturbed by the light , all seems calm. But when one spark of Gods light as a candle illuminates the room, there shall be a fury of activity few know why, by those that live in hiding. But all of them have been published and have various good size groups openly teaching them, and place the world in a religious division of word. All except ONE..... The Gnostics of Jesus Christ the world went into a flurry of activity to Kill them at all coast and every follower. Our friend Paul was used to change the teaching of someone they knew could never go away, and created a similar but misleading concept of him to believe. Plus the crusades for centuries of Killing,,,,, one would think My god is he that important and also was his text that damaging to everyone? indeed He was, and yes they are, so important they were talked about in Daniel 9 on the bank of the river, for the last generation will understand them perfectly. The light does not lie, and the dark cannot rest. Jesus Brought about the New Covenant to the Mortal plain for Gods children to learn which was never here before, Yes there were Godly people but None spread the seed as taught by Jesus to do, which is the only way to take him on unto yourself, "for all those the believe on my name" Nothing like this was spoken by any other profit including the Baptist "whom was greatest amongst those born of woman"
Yes Christ was in the beginning always just as the Father, but to be born of flesh was in the special step of time, according to the Human progression. Bob These things I will leave to you to ponder at your interest Sir, as Christ also told his disciples there are many things for you to know, but while in the body one could not perceive of such things. Bob the big difference between you and I is just one thing at this point in time. Jesus Christ as being the living way, but again also not even Him but his works and words take unto your heart as yourself. Remember there are some tares, not the whole field. I can hear that there is a Moses in every generation. I can believe it or not. For me it doesn't make any difference. As far as needing an external living teacher, I believe that some people need them, not because they are flawed, but because our environment has taught us not to listen to our hearts. I believe that we have everything we need to succeed once we get past childhood. My very dear brother Thomas, with all due respect and Love to you, I must however represent all that has been revealed to me in all its glory - whether it is accepted here as Truth or not. Due to indoctrination by the social conditions of one's upbringing, all peoples of all ages are conditioned to perceive certain things as superior to all else (rather like little children believing that their own parents are "better" than anyone else's). Christians thus believe Jesus to be superior to any other Spiritual Teacher - they even believe him to be God (Elohim) Himself - and some thus believe his mother Mary to be the Mother of God! Well, with this in mind, is it surprising that so much intolerance and hatred is expressed between different religious traditions - those that hold Buddha to be the supreme Lord/Spiritual Teacher, or those who believe this of Krishna, Moses, Mohammed, etc. etc. Those who believe that any of these great Spiritual Masters came from, or taught about, a 'different' God or Truth are simply perpetuating the lies of satan - the carnal ego, the pride of religious authority. Religionists who believe that their own historic Master was superior to any other are very mistaken. When people come to recognise that ALL genuine Spiritual Masters taught/revealed the SAME ONE TRUTH, perhaps we can begin to have a true understanding of the Spirit. I have studied for many years ALL the available scriptures of ALL ancient religions and come to the conclusion that ALL Spiritual Masters taught/revealed the EXACT SAME THING! - it is only orthodoxy that has corrupted the true understanding of these religions. So, to claim that Jesus/Yehoshua was/is greater than any other Spiritual Master is the very height of ignorance - and an insult to any other (religious) tradition. Only when one comes to realise this FACT will it be possible to turn to Truth once more, as it was in the beginning. Lig wrote: I can hear that there is a Moses in every generation. I can believe it or not. For me it doesn't make any difference. Would it make any difference if it was a "Jesus", or a "Buddha", etc? Would you still be one to turn your back on such a Spiritual Teacher living during your lifetime? Lig, have you not learned anything during your time communicating here on this site? Think how much more a genuine Spiritual MASTER like Jesus could teach you if he were living today and you could meet him personally. Of course you have everything you need - but how to obtain the best out of it is the real question. Greetings Bob , I pray you don`t mind if I can help slow this down abit in understanding and decernment of seeing that which is usefull to know, and to stay in touch with our own journey`s. I understand that thier were many profits, yes Jesus Christ also said he was, but was that the extent No, His disciple said to him for you are the son of God, whereby He said " tell no man this " due to that it would prevent Him teaching as a profit, and peoples wants would be greater then thier quest for knowledge. so then we have David, daniel, Noeha, Enoch, Mosses etc. The one thing I did not and can not do, is to lump them into one Catergory for what they were about. I had to reach and find as much as I could on ach man in order to know how much of there words should be taken as fact the best I could, with all the Earthly doctines and Biographies while adhearing to the Spirit to guide me always. What I found was amazing; Did you know, aand you could look this up in libraries, that King Solomon was a very good and righeous King during which was writen about him for the Publics view, But what was not written was , how much he back slide from the Truth in his later years so much that he was the leading Aurhority and wrote the Main Book on witchcraft, that they follow today. You mentioned Mohamed as a profit. He was the easiest one to reseach, seeing he was one of the last main characters in question way after Jesus time here and also the change into the piecean Age. up tell now almost at the Aquirean, around every 2000 years. Here are some much reseached findings I found on Islam and Mohamed you may enjoy . Alberto Revira truly reveals and connects some dots that has never been but always needed to be. telling any soul of the islam faith there founding, just as I being a former Catholic and not as dedicated would be fruitless. But the truth is the truth. He was no prophet but choosen by Jesuits and given a written agenda and teaching to carry out, for the Vatican. They were the replacement for the crusades. Those sites will show you of all icons and there Backing and meanings. Also the 5 books of Mosses also has exact word writtings of old Sumerian texts thousands of years prior to egyptians , although I do believe a Mosses of some sort was present here as a great religiiuos figure from the Gnostics of Christ talks of him, as does the same in the NT. Thus many cross referancing points brings the credibility higher. See for this stuff Bob I am more of a doughting thomas till I have satisfied my own seeking from the point of showing others, just as a scoutmaster as I had to be. The lord showed me why I have lived the way I had, not just know but lived. But coming back to the continuation of the Living word in men to show others, does it realy matter how we ourselves learn it, and know it, whether it be By Mouth, Books, nature, Spirit, although the lower sources have a bit more tares mingled amongst them. No it doesn`t matter as long as its the truth and we Find it to be the truth. I have seen people discuss the Bible for hours in division , and the only thing they got out of it was a good cup of coffee and some talk. I figure a good game of Golf would be more building for souls then that ayyy? Oh ya also Jesus being Superior,,, no not at all, He is a servent and brother to man not His ruller.... Even the Father does not want to rule us, He created us in His image, with His seed, He would be rulling himself, the same as sometimes we do to our selves because of that seed. He wants unconditional Love..... exactly were tobias is at .....wow. Bob here also is a article where a noted Rabbi in Israel with a wide following reveals after dieing the true Mesihia (savior) My spealing is off. Brother Thomas, for someone who claims to have guidance from the Spirit of God - you sure seem to rely a great deal on man made books and very dubious and biased (and even comic/childish) internet sites for your information! Quite frankly, what you imply about Mohammed and Islam is total nonsense. The whole point of GNOSIS is that it is INNER REVEALED SPIRITUAL KNOWLEDGE - NOT from external sources! I can honestly say that none of the historic Masters, or their dubious and uncertain histories - learned about through corrupted books and traditions, myths and legends - have any real relevance to me now. I most certainly comprehend your current beliefs about Jesus - I too was once indoctrinated by the religious errors of blind belief - I thought Jesus was the only way. Now I understand that Jesus was the way 2,000 years ago, just as Buddha was around 2,500 years ago, or Moses 3,300 years ago, or Mohammed 1,300 years ago. Don't misunderstand what I am saying - I have the highest respect and love for Jesus, as I do for all great Spiritual Masters - but my deepest Love goes to the Living One who revealed the Four Great Mysteries to me, and started me on my path to true Understanding and Enlightenment. I hope you can comprehend. Oh dear I feel misunderstood. Let me try to explain further. No, it would not make a difference whether it was Buddha, Jesus, Mohammad (sp), Moses, or whomever. I hunger for someone that knows to help me know, I have been waiting and hoping to find such a person. I have begged and pleaded for someone to come along whose voice rings of nothing but Truth. So far I have not found such a person, though I think someone with the right idea found me for about a month at work. They seemed to know things, though it was unfamiliar and the more I heard the more it was off somehow so I didn't keep in touch. He and his wife claimed he had been brought to my workplace to guide someone and that he thought that someone was me. It was flattering, but off. As far as learning from Masters, of course it would be wonderful. I feel that we learn bits of Truth everyday from the Master in all of us. An errant word from the strangest sources can awaken ideas in us that make us grow. To have it all in one place would bring me to tears. Just the thought that I don't already have this person is just about bringing me to tears now. Until that time comes, I will just have to take the pieces of the pie that the powers that be drop to me from the table. Perhaps it's not in the knowing, it's in the journey. Best of luck (I mean grace). Bob I presented some things here of the mortal realm to be considered only my friend For the Father is the only truth, and we live in a mixture to be remembered as that. I have seemed to have been the messager that was attacked, and not the message. I have never crossed the line to what someone has believed or has seen, due to the vast size of Gods infinate powers and reasons are not all the same. I have been trying to understand yours just for the peace since of common discussion.. ONLY. from past posts bob you have told us to attach scriptures to our posts, and given us sites where to find text amply, which gave me the indication You do hold some value more and less from them. But your questioning to me for following them and the internet is now a negative. I`m puzzled still. You talk of the cessation of masters, which I allso follow somewhat on that, but you feel yours must stay Hidden for some reason, again I am puzzled why. Is he not a learned sourch of your joy in the Father and what he then not be a large part of the vine as Christ is, and not to be denied in, but shown to alll those who ask from the heart. Bob I only am trying to understand for haveing true umity in Talking of varied gnosis in the father, I am in opposition to no man, I was hoping intuition was going to relax this post awhile, so it did not go this far my brother truly. I respect your journey for what you see, and its up to anyone else if thy choose to respect mine, but there there has been no doctrine or article I have witness too that has been proven false Yet, only assumtions and childish reverberings. By finding a valid proof that they are in error I would welcome, For I do this unto my own research to see it is what was shown me is a fact from many sides. Prism1111 wrote: Did you know, aand you could look this up in libraries, that King Solomon was a very good and righeous King during which was writen about him for the Publics view, But what was not written was , how much he back slide from the Truth in his later years so much that he was the leading Aurhority and wrote the Main Book on witchcraft, that they follow today. You mentioned Mohamed as a profit. He was the easiest one to reseach, seeing he was one of the last main characters in question way after Jesus time here and also the change into the piecean Age. up tell now almost at the Aquirean, around every 2000 years. Here are some much reseached findings I found on Islam and Mohamed you may enjoy . Dear friend Bob, Do you remember how intricated you resolved your question in Paul unto yourself? I highly congradulate you on the insightfulness and the deepth in which you investigated Him to leave few questions as to his relavance as a self proclaimed disciple first to your own eyes, then to others as they even now have a hard time believing these things. These things I have told you have been set up to avert anyone randomly checking for validity and correctness. Now the first site you brought up is own by CBS a Jesuit run broadcast. Aberto was one of them that Choose Christ over them (jesuits), with research you will see they are the mind twisting Group of this New world order you hear so much about now, from all nations. Also a Vatican site would certainly try to descredit him They hire Fransis Layola the first Jesuit desquised as priests to do the Popes biding. If you go onto any RCC site you will not see Christ mentioned once. Only Mary the queen of heaven who is osirirs and the other one. I don`t exspect anyone to do that much vast reseach to attain this earthly truth, But the adversary has difinate plans as we speak to control all mankind on this level, just as God has plans for us when comming out of the need of the world and its mixture. If You are satisfied in what you have found, it is only for your own degree you seek. Many folks here know that the New world order is comming, who do you think is realy behind it? when one finds that answer now you are in the game, and can truly releasize the importantance of oneness and the fathers Mysteries of his word. This is the shield and then you will know the strenght it needs to be in you. Prism1111 wrote: Now the first site you brought up is own by CBS a Jesuit run broadcast. The first site I referenced was The Independent on Sunday, The Sunday magazine edition of the highly respected London newspaper, The Independent, which offers coverage of news, business, sports and leisure. Please show me evidence that this publication is connected in any way to CBS, and more specifically, to the Jesuits! Prism1111 wrote: Dear friend Bob, Do you remember how intricated you resolved your question in Paul unto yourself? I highly congradulate you on the insightfulness and the deepth in which you investigated Him to leave few questions as to his relavance as a self proclaimed disciple first to your own eyes, then to others as they even now have a hard time believing these things. We know that a 'physical' Christ in Jesus is not coming back, we know that the adversary will use what it has used as its biggest weapon. Gullibility! The nation of Israel was put back on their own land due to the NWO which is very fundamentally backed. For it is the broad road that leads to destruction and the narrow road that leads to the Father, and 3 billion 'Jesus' callers is a very broad road if you ask me lol. Jack Trick is not one who I admire, for he uses a lot of scare tactics (just like the NWO in their Russia, Terrorist themes) but I judge no man I only see the fruits of their soul. Peace and Harmony through Unconditional LOVE to everyone! Gnostic warrior, greetings brother, I realize what you say and do not see Jesus coming in the clouds no. For those that are mentally lock in the bible for salvation and seeking others to explain it is a gullible sad state of afairs indeed. Unless one can seek that journey inward alone with God, useing sign posts along the way to be inlightened at each step of progress, one will miss that narrow gate all together. Jack trick now, yes I do also see him as abit harsh in His damnation testimony and real shy away from that sort of Teaching, allthough his actions are for the glory of God which is not bad. He is still associated with the 3 billion as he states , being a Baptist-Calvinist. He has no dark agenda and no past that turns him up bearing false credentials other then the way he comes accross. Now Aberto Reveria Gave his life to inform all who would listen to what he found as a Jesuit, His wife can be herd speaking still today. Hello Bob my brother, I do have to applogize for joining the link you sent me. Bnet you can see is associated at the bottom with CBS in easy view. The independent is British and I have not reseach persay the list of under control of that country. If it is open to public accesss rest assured its controled. Remember the Logis for CBS ? the all seeing Eye = Illuminati = jesuit. This is a real brief connection and summary of many years of reseach. If You are really asking in an honest seeking nature the answer and all proof to the connections I would be more than glad to show you Brother. Many have ask me and hae stopped long before the finish becuase it gets real personal, not to pretty to know what we are and have been living in, but as the parable goes " If you knew the thief was coming You would have been watching to see that your house was not robbed"
So below I have attached a You tube vidio, This is quite long but explains all I have discussed and why. If you wish to to seek deeper than this Your questions can try to answer and will be Happy too. Brother Thomas, I am afraid that anyone who seriously believes that the ancient Islamic Religion, along with its founding Prophet Mohammad, was in any way the "brainchild" of the Catholic Church, needs their head examined. What evidence do you have? - the word of some modern day cranks who obviously hate all non-Christian religions (as well as the Vatican)? Do you think that every single one of the billion or so Muslims would be totally blind to the truth - that their religion was started as a "con" by the Vatican? Do you also believe any of the various stories about Jesus - e.g. that he was the illegitimate child of Mary and a Roman soldier? There were also many other such stories. I do not bother myself about politics and outward signs and rumours - what matters is internal, esoteric, and SPIRITUAL - everything to do with the BREATH of LIFE - the knowledge of which is GNOSIS! Admin wrote: Brother Thomas, I am afraid that anyone who seriously believes that the ancient Islamic Religion, along with its founding Prophet Mohammad, was in any way the "brainchild" of the Catholic Church, needs their head examined. Dear Bob , Your question to me was,,,Please show me evidence that this publication is connected in any way to CBS, and more specifically, to the Jesuits! Because the understanding of the depth of thier influeance in the world is the souce and key giving validity to pretty much everything else that is of the dark, which is emmense. so this is what i attempted to do from your asking. But instead you have switch subjects, and I have no idea were the mary and roman soldier comes from, I never even mention that. wow by the way, the head examine thing was also said about the large number of Christians to me and the Paul issue too huh Hmmmmm.... makes one think, Thanks.